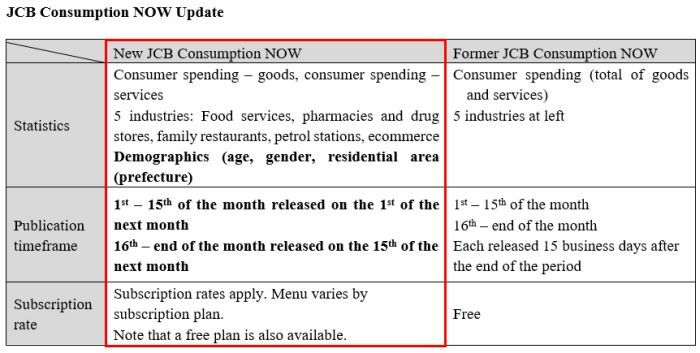 TOKYO, Oct 2, 2018 - (ACN Newswire) - JCB, the only international payment brand based in Japan, and Nowcast, a Japanese financial research and technology startup, are pleased to announce the release of the updated and expanded consumption index service JCB Consumption NOW on 5 November. JCB Consumption NOW was launched in May 2017 to enable users to track Japan retail consumption trends on a real-time basis. A wide range of national and local government agencies, institutional investors, financial institutions as well as consumer-goods companies have been taking advantage of the consumption indexes based on JCB group cardmember spending data.